Two sources of previous inspiration collided recently. A lunch at Ozumu introduced me to yuzu and then a couple of weeks later a pass through the Village Market in the Ferry Building turned up a jar of yuzu marmalade. I took it as a sign that a yuzu cupcake was in order. Yuzu is making its rounds on dessert menus these days often paired with white chocolate. I decided to go the same route. I thought about a third flavor, but wanted to keep this first experiment pretty simple partly because I was taking them to a party with a lot of kids. The yuzu marmalade is quite tart and at least my kid wasn’t a fan. She ate up the rest of the cupcake though. The adults agreed that the yuzu and white chocolate combination was tasty. The white chocolate whipped cream is a light alternative to buttercream when you don’t want something too sweet. 3. Whisk together flour, baking powder, and salt in a bowl. 4. Measure out milk and vanilla and mix together. Add the seeds scraped out of 1/2 of a vanilla bean. 5. Add about a third of the dry ingredients to the mixing bowl and beat to combine. Add about a half of the milk and beat to combine. Continue adding, alternating between dry and wet and finishing with the dry. 6. In a separate bowl, beat the egg whites until firm. Fold egg whites gently into the batter until you can see no more streaks. 7. Scoop into cupcake papers about half full. Don’t overfill. 8. Place cupcakes in the oven and turn the oven down to 350 degrees. Bake for 20-22 minutes until a cake tester comes out clean. Note: These cupcake will rise some and then shrink back a bit. If you are using regular cupcake papers, the paper shrinks with them. With the firmer cupcake papers I use, they pull from the side. I don’t worry about it too much as it’s not obvious once the frosting is on top. 1. Pour heavy cream into a medium sized bowl and warm over a bain marie (water bath). 2. Split the vanilla bean and add it to the cream. 3. Chop the chocolate and add it to the cream once its steaming. Whisk to melt chocolate. 4. Once smooth remove from the water bath and chill until cold in the refrigerator. Whisk occasionally so a film doesn’t form on top. 5. Whip with a whisk attachment on high speed until for about 3 minutes until it’s frosting consistency. 1. 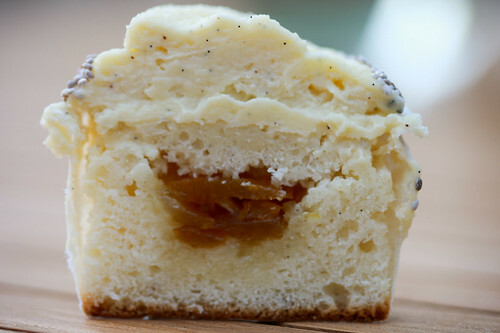 Fill the cooled cupcakes using the cone method with yuzu marmalade. 3. Garnish with what you have on hand. I had some chia seed! that sideshot is absolutely amazing and I love seeing all those vanilla bean flecks. the yuzu marmalade was sold out when i went to the ferry building! i have some asian citrus marmalade/tea concentrate which i think might work fine enough, i think it’s a blend of pear, quince, and yuzu. do you think you could use yuzu juice in either the batter or frosting? This has to be the most unique cupcake flavor by far, very interesting. Good job! What a great combination, and the photos are beautiful as always! How beautiful. I love the sesame seed rim! oh – absolutely delectable combination. it sounds very lovely. i love the whole presentation too! Impressed to see you’re using Green & Blacks to bake. I love to use Scharffenberger myself.I’d never heard of Yuzu, thanks for the intro. These look wonderful, I love the addition of sesame seeds. This is certainly a unique flavor profile! Yummy! 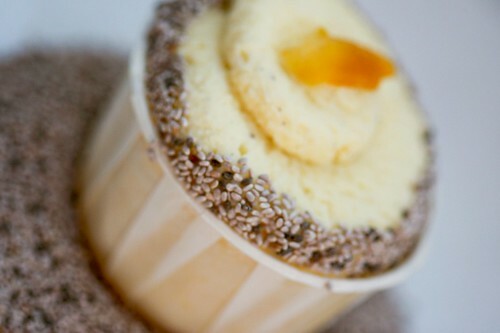 The side shot makes me craves to eat these cup cakes right now. I probably make this recipe thus weekend. 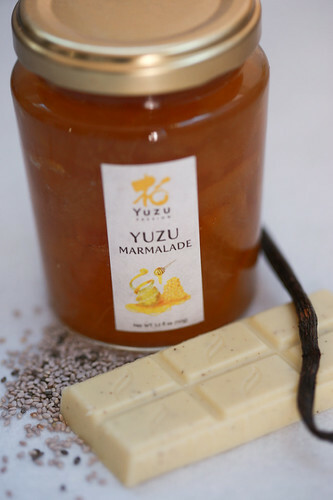 I will have problem with the Yuzu marmalade. It is very difficult to find it here or it is always sold out in the grocery. This looks melt in your mouth incredible. I’m not a big cupcake fan, but that one looks delicious. And great photos! Yummy! This is so mouth watering. I can’t wait to taste and eat plenty of these cup cakes. I will surely try this tomorrow. My hubby surely loves this one. I should add some dark chocolate syrup for adding some flavor. Yumm. I love Yuzu and love your creative cupcake recieps. I made the white chocolate whipped cream – WOW that’s some intense white chocolate!!! I might cut down on the amount – maybe 6 ounces? The texture of these cupcakes are amazing. Just from the picture, you can see the moisture and the fresh taste of marmalade. Great post and I love the recipes!